Each year the Annual Appeal provides a fantastic opportunity to visit some of our most committed donors. This week we visited Margaret Macdonald in her home. Margaret and her late husband Rod Macdonald have been regular supporters of the Melbourne High School Scholarship Fund for many years. Margaret said one of the highlights of donating to the MHS Scholarship Fund is receiving letters from the young men she and Rod had assisted. According to Margaret, her late husband Rod had a similar story to the students that she has been assisting through her generous donations. As a student, he had benefitted from a travel scholarship that helped launch his career. This experience inspired him to generously support students in need through donations to the Scholarship Fund. Rod attended Melbourne High School in 1938 and 1939. After the war he graduated from RMIT with an Architectural degree and joined A S & RG Eggleston. In 1954 it became Eggleston, Macdonald & Secomb, and in 1983 Eggleston Macdonald. The practice was responsible for many great buildings of the post-war era, with Macdonald as chief designer. 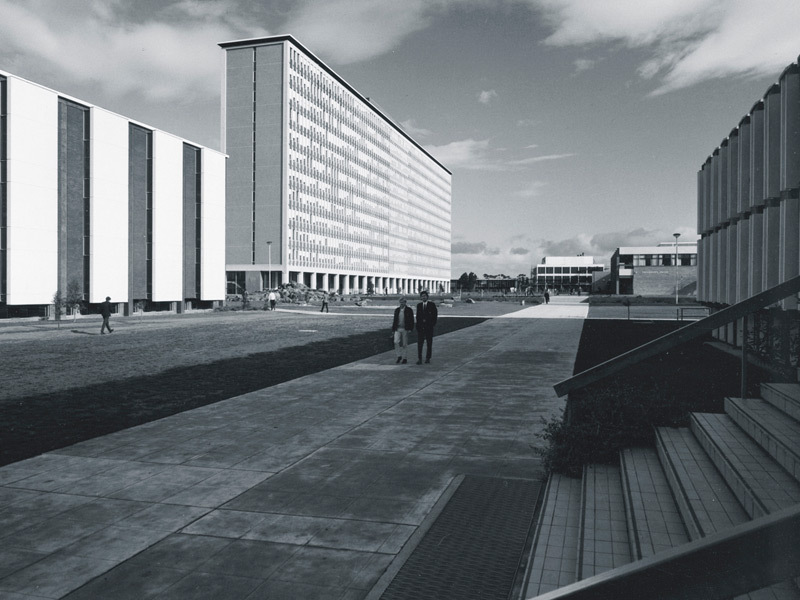 One of our favourites is the landmark Robert Menzies Building at Clayton Campus, Monash, pictured above. If you would like to help this generation of students to achieve in every aspect of their lives, donate to the Scholarship Fund in this year’s Annual Appeal.